← Yeahhh! Make China withdraw to its ‘proper’ borders @A Merkel, a Map, a Message to China? What is “China proper”, its ‘original’ borders? China proper (also Inner China) was a term used by Western writers on the Qing Dynasty to express a distinction between the core and frontier regions of China. There is no fixed extent for China proper, as many administrative, cultural, and linguistic shifts have occurred in Chinese history. another to the “Eighteen Provinces” system of the Ming Dynasty**. While “China proper” is associated with the Han people, many Han live and have lived outside of China proper. The term was and is not an administrative distinction for the governments of China. Today, the term is controversial and usually promoted by separatists to argue that certain areas are not culturally a part of China. * 409,500 km² (158,100 sq. mi. ), about 3 times the size of New York, USA. 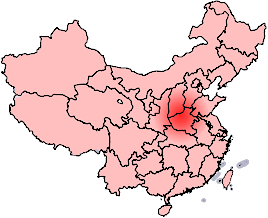 ^The earliest Chinese civilization in the Central Plain was an area larger than England, Wales and N. Ireland combined (63,000 sq.mi) It was regarded as the cradle of Chinese civilsation. This is an area on the lower reaches of the Yellow River and is included in the North China Plain. ** 1368 to 1644 CE, 6.5m km² (2.5m sq. mi. ), larger than USA’s 15 largest states combined. Chinese Grography: Lesson 1 What is China? This entry was posted in China and tagged China Proper, Independence Movements, Inner Mongolia, Manchuria, Tibet, Uighurs, Xinjiang. Bookmark the permalink.